For more than four decades, Rev. Richard John Neuhaus was one of the most influential voices for religion in the public square. From his advocacy in the Civil Rights Movement, to his active defense of the unborn through the Pro-Life Movement, Father Neuhaus was a stalwart defender of a just republic built upon the dignity of the human person. A Lutheran who converted to Catholicism, Father Neuhaus was a leader in bringing Evangelicals and Catholics together around a range of issues, including theological, social and political. A gifted writer and public intellectual, Father Neuhaus founded the Institute for Religion and Public Life, and its magazine, First Things. Following his death in 2009, his correspondences, publications, and photographs were collected and formed into the Richard John Neuhaus Papers, which were donated to the American Catholic History Research Center and University Archives at The Catholic University of America. Following the completion of the cataloguing of his papers, the University is hosting a symposium celebrating the life and work of Father Neuhaus on Wednesday, March 7, 2018. 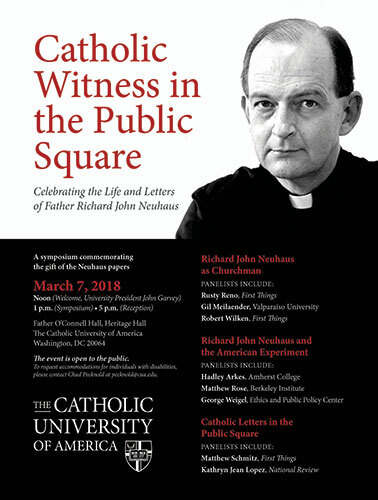 “Catholic Witness in the Public Square: Celebrating the Life and Letters of Father Richard John Neuhaus” will include a series of speakers discussing Father Neuhaus’ life, work, and faith as detailed within the papers. The nearly 100 boxes of cataloged papers include his correspondence with prominent contemporaries, newspaper articles and other writings, photographs, and personal items. The event is open to the public and will take place from noon to 5 p.m. with a reception to follow in Father O’Connell Hall, Heritage Hall, 620 Michigan Ave. NE, Washington, D.C.
For more information or to request disability accommodations, email pecknold@cua.edu. MEDIA: To schedule an interview, view the Neuhaus Collection, or register to attend the conference, contact the Office of Communications at communications@cua.edu or 202-319-5600.